Shadowflag are a band from the United Kingdom that plays a poetic form of black metal and this is a review of their self released 2017 album "The Delusion Machine" which will be released in June. Soundscpaes, drones, and spoken word samples start off the album before going into a more heavier and melodic direction and you can also hear a lot of melody in the solos and leads along with all of the musical instruments sounding very powerful and when the music speeds up a decent amount of blast beats can be heard. A lot of t he songs mix both the atmospheric and heavy parts together and some tracks also add in avant garde elements which also gives the songs a more experimental feeling along with a brief use of atmospheric synths as well as some doom and thrash metal influences and a couple of the tracks are very long and epic in length. Shadowflag plays a style of black metal that is very modern while also having their raw, melodic and atmospheric moments, the production sounds very professional for being a self released recording while the lyrics cover poetic and philosophical themes. 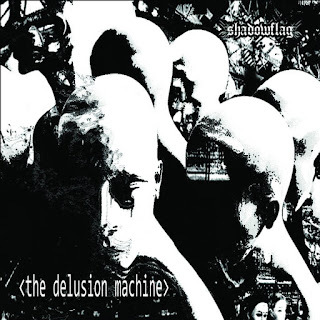 In my opinion Shadowflag are a very great sounding poetic black metal band and if you are looking for something that is different, you should check out this album. RECOMMENDED TRACKS INCLUDE "The Beasts That Perish" "Kingdom Of Zero" and "Singularity 45". 8 out of 10.